Einige japanische Unternehmen schicken ihre Berufseinsteiger zu Zen und Buddhismus Kursen in Zen Tempel um den Berufseinsteigern einen moralischen Anstoß zu geben. Diese Untersuchung wurde im Jahr 1986 veröffentlicht und war die erste ihrer Art. Sie war der Ausgangspunkt für weitere wissenschaftliche Arbeiten zu Zen und Buddhismus in japanischen Unternehmen (Zwischentitel in dieser Bearbeitung eingefügt). Some findings, but unfortunately no definite data, Iet us speculate that a not so insignificant number of Japanese cornpanies uses Zen-meditation in their em­ployees‘ training programs for their newly recruited staff as well as for their mana­gerial staff. As this sort of training is widely unknown in Western companies, the interest awakes, if, and if yes, in which way this training influences the companie’s actions. To act economically means always to act in a social network. Social networks on the other hand are defined by the main philosophical currents of a society. Today’s high-tech-culture Iooks the same in Europe, USA and in Japan, but the underlying philosophical background is much different. In this sense a countless number of books has been published. However, one aspect seems to be a little bit neglected so far. I mean the influence not of a religion or a philosophy, but of meditation, particularly of ‚Zen-meditation, because this type of meditation is the best known in Japan. The main difference between meditation and pure philosophy or religion is that not only an intellectual, abstract understanding is aimed at, but a bodily feeling, which is – as all meditation teachers often and often say – much deeper and opens, as they say, the way to absolute truth. This is a significant dimension, which Ieads to the following thesis: If economic action as well as every social action is defined by the underlying philosophical currents and these currents are different in different societies, the actions must be different. These differences are to be found out, to get a better understanding. If, in addition, some people or some groups of people in some companies practise meditation, which Ieads not to an intellectual understanding but to an intuitive perception of reality, these people, groups or companies must be different from others. Of course, under the premise of the meditation teachers, this type of perception of reality is much deeper than only an intellectual perception and is able to change one’s complete life. What must be found out now under the above assumptions is which perception is conveyed by these teachings in companies and how they can influence social actions inside the company and outside. „JNR hopes Za-Zen will help boost morale“, was a catchline some time ago in Japanese newspapers. The Osaka Regional Railway Federation, fighting criticism of their employees‘ lax working morale, introduced Zen-meditation for their staff to reinforce the quality of its work. 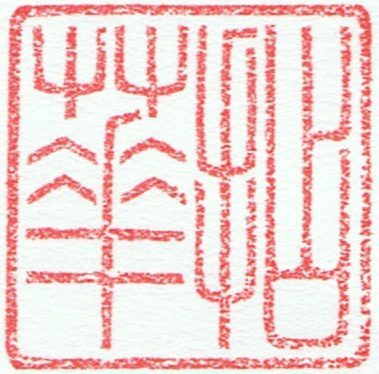 In the first run, 700 employees in groups of 50 persons entered the Myoshinji temple in Kyoto. Starting from this point, I checked up on the spread and meaning of Zen-meditation in Japanese companies (Summer 1984). It must be assumed that there is a difference in the motivation for these courses for newly recruited staff and for the management. JNR, the state run railway, told the press explicitly that their motivation is to raise the working morale. 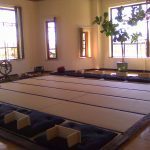 It is easy to assume that their interest lies mainly in the strictness of the daily routine and in the kyosaku, the flat stick of the Zen monks, which is used to discipline an inattentive trainee. Another motive is to be assumed at Matsushita Electric, the greatest manufacturer of electric devices in the world, 39.729 employees in May 1984, average age 32. Matsushita Konosuke, the founder of the company declares himself to be a meditating person, he is using meditation as a means of developing his intuitive powers. Some these ideas are: a business should always be operated for the public welfare and not for private profit, always think of the customers and express gratitude to them for their patronage, express gratitude in a free after-sales service and so on. Since 1946 he is running his PHP Institute, which stands for „Peace and Happiness through Prosperity“, to spread his ideas. Everyone of his employees knows his seven principles, which are mainly moral and ethic rules, two of them were added four years Iater: „spirit of accord with natural laws“ and „spirit of gratitude“, both points are also frequently mentioned in speeches of Zen masters. lt is said that Matsushita is not practicing Za-Zen for himself, but „emptying his mind“ by sitting in front of a miniature shrine, modelled after the architecture of the Grand Shrine at Ise. He sees the development of the individual to be of critical importance to an organization. Each individual is urged to be his own self­ starter, exercise on his own initiative, take responsibility for his own decisions and actions, become, in a word, personally motivated. Other big companies, who send their employees to Zen-training courses are: Bridgestone, 5th among the world’s tiremakers with the highest profitability, 16.800 regular staff; Diesel Kiki, top auto parts maker, which semi·monopolizes the fuel injection-pump market, 5.530 regular staff. Nichii, 9.500 employees, ranks 5th in supermarket chains. 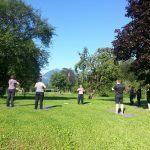 It was impossible to find out exact data concerning the number of Zen training companies, because statistics is not part of the Iifestyle of a Zen-priest. In the Soto-shu headquarter (6.8 million members), the „foreign affairs“ monk declared only that the number of temples offering Zen courses for companies is growing. The prices are low, with 3000 to 5000 yen per person and day including food and lectures. They are cheaper than a youth hostel, but anyway it is a valuable contri­bution to the conservation of the temples. There is also a correspondence course in cooperation with the state run television station NHK, which costs 1500 yen per participant. The children’s toy manufacturer Bandai may be considered as an example for the pragmatic approach to Zen. This company has a regular staff of 770 employees, 100 of them only in the marketing and innovation section, the sales reach 70 billion yen. One can find Bandai toys in Europe also, but the selection of products includes also video-games for adults, vending machines, teaching machines and bicycles. Za-Zen, so I was told, is not used for religious reasons, but most significantly to swear in the fresh hired staff to the company’s business policy. After the great freedom of the university the beginners should get an initial shock. Therefore they use a sort of hot-and-cold therapy: five days at the jieitai, the Japanese military forces and after that two days in a Zen temple. At the military camp the men – women practise gymnastics and fitness trudges – are kept on the go; it is only allowed to be on the run and they are woken up several times each night. They should become like people „who eat out of the same pot“. The two days at the Zen temple should help to sooth the nerves. Waking up at 6 a.m., garden work, gymnastics, five hours Za-Zen per day, in between lectures like: „What we mentally should not neglect“, and copying sutras as much as one can. In the past, these trainings were held at the Sengakuji temple – and waking up was at 4.30 a.m. – , but the adjustment to the monk’s life was too hard for the utter laymen. Nowadays the course is held at the Grand Hotel in the center of Tokyo, the headquarter-tower of the Soto-shu, with some Japanese-style rooms and gardens in the upper floors – the „Vatikan“ of the Soto-shu, as one monk said. But Bandai’s president and higher management still visit the Sengakuji temple once or twice a year. In their final reports, which all participants have to write, they said among other remarks: one trainee wondered, why, at lunch, chicken steak and strong coffee were served, he would prefer simple, vegetarian monk’s dishes, as they were shown in a movie they had to watch. Another found his days at the military forces a harrassment, but Za-Zen useful for his favorite sport – shooting. Not so funny, a woman wrote that she was in tears, when the priest spoke about the real meaning of gratitude. All of them found the lotus-seat very painful, but, as one participant annotated, pains are the first step on every way, he would also try to be patient of any injuries in his company life. Like this, a woman saw Za-Zen as a good preparation for her company life, in which she would have to make supreme efforts. For the first time in her life – she continued – she had been able to empty her mind amid the metropolis. Very different another participant: he, so he confessed, thought of nothing else than when the end of all this mess would come at last. As one can see, the opinions stretch from total rejection to the intended adaptation to company goals to real enthusiasm. If, a priest of the Rinzai-shu added, ten percent remain practicing Za-Zen, it would be a great success, because this number would be enough to support the company and society. propositions, which are of a general, philosophical type. Of the first category is to have a more happy, more fulfilled life. As an example, this is to be gained by being aware of any action one is doing, whatever it may be. 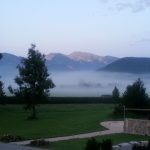 One should awake in the morning – preferably as the monks do, before dawn – and devote one’s full attention to the act of awakening. Thereby the joy of being awake is gained and the languishing for still sleeping fades. One is restrained from thinking about the next plan, while doing one thing. The result is an extrication from everyday worries and the awareness of the beauty of life. In this sense, the garden work in the temples is done ritually, even highest monks can be seen sweeping up in the moming. A symbol of this way of thinking in the arts is the tea ceremony: a ritual, which should make aware of how a simple action like drinking tea can be a spiritual experience. One should act like this within the company. One should devote oneself to any required work, it may be as stupid as it will. This marks the transition to the second category, to the propositions, which aim at the prosperity of the company and the nation. As a monotonous work becomes a positive value for the person, it helps the company to more prosperity, which also brings benefits to the person. A society full of prosperous companies is as a whole a more happy society. This spirit spreads out all over the world. This sentence links up with the way Japan’s economic heroes see themselves: as national benefactors and patrons of the world. The philosophy of life conveyed in these teachings is a universe cosmogony. This third of our categories teaches that all sentient beings in the world are linked to each other, there is no event, which is not conditioned by another and does not condition all others. Evecy participant in a Zen-session should feel this responsibility and should be conscious that he is an exponent even of the stars in the sky, a part of a cosmos which connects all beings and all events to a unity. A kick in this system causes a movement also in all other parts of the system. Ethics and morals thereby get a cosmic dimension and are not only functions for the individual and his vicinity any more. This shows the link to the Japanese concept of en, as it is also used frequently in everyday language. The infathomableness of this word may lie in this mystic and esoteric dimension. The phrase „l’ve been fine, thanks to you“ (okagesama de), the feeling of a connection between two persons as soon as an en has been found out, the idea of the need of a universal gratitude are indicators that this concept has become a part of the non-conscious everyday knowlegde. According to this concept, business success, like everything else, depends on various unseen or unknown en. A good action or a good mind has an influence on the whole system and thereby benefits the person him- or herself. Obviously such teachings do no harm to the company. Further, the sararimen to-be are instructed in the right way of greeting and bowing etc. The relation of meditation to health is also important. Some members of the middle and higher management want to start meditations when they feel a heart or stomach disease in their midlife crisis. But this is the wrong approach, Zen-masters usually say, and useless, too. One has to do Za-Zen without any intention, with an innocent mind. Listening to the teachings alone is useless, one has to gain his own enlightenment, which cannot be described in words, but is a bodily feeling, the bodily awareness of the unity. Perhaps it can be gained after ten years of „sitting“, maybe instantly, maybe never. Persons who are enlightened in this way have a strong influence on their vicinity (see note 6), and thus only a few people in a company or in a society would be enough to support the company or the society as a whole. These courses, even if they last only for two or three days, are the attempt of a socialization within the company, which uses a model very different from the westem ones. A survey of Austrian managers shows that they Iike to see themselves as lonesome heroes who fight against everybody and everything. The model of a Japanese manager, however, is a master in the art of communication who gives all people a chance not to feel outwitted. But participation without the corresponding surroundings does not bring the desired efforts. Therefore it is to suppose that these courses with their implemented ethic basic content are more or less a compromise. lt should be mentionend, however, that they are seizing an intracultural trend. It is not easy to find out the particular interest of the companies who send their employees to these courses. It can range from the simple intention for disciplination and moral instruction to real esoteric convictions. Complaints by the trade unions, as in the case of the JNR, claim the use of Za-Zen is running counter to freedom and religion. This may be the cause for the company’s speakers‘ statement that these courses have nothing to do with religion. But there is also harsh criticism from Buddhists. Since the Kamakura period, they complain, there has been a long tradition of close connections between Zen monasteries and the respective ruling powers. As in former times Zen teachings were used to strengthen nationalism up to war wageing, Za-Zen is nowadays used to achieve greater performance by the employees. As formerly to the central government and its policies as embodied in the person of the emperor, loyality is now enforced to the corporation and its interests. 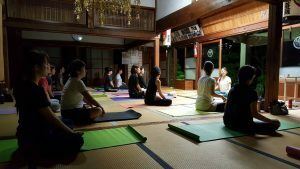 As I have tried to point out, Zen courses as they are used by a number of Japanese companies can have a not so insignificant influence on the management and the labour staff of those companies. Further studies will be necessary to gain accurate data and economists and those concerned with Japanese studies should work together on this item to find out if it is valuable to send European managers to self-examination weekends to a monastery to compete with their Japanese counterparts. The word „Zen meditation“ is, strictly speaking, a pleonasm. Zen (Sanskrit : dhyana) means meditation, but I think it is easier to understand when called Zen-meditation. 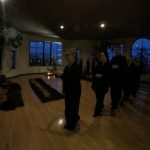 Za-Zen means meditation while sitting in the lotus-seat, having the backbone stretched and looking with half-closed eyes at a wall or an imaginary point about one meter in front of the person. In some monasteries so-called koan are used, which the trainee has to think about. A famous and well·known one is : „How is the sound of clapping only with one hand?“. 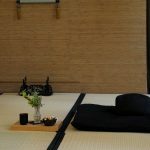 Propositions about Zen in this article are mainly based on : How to practice Za-Zen by the Institute for Zen Studies, Hanazono College, Kyoto, o.J., and Zen- Weg aus einem Punkt by lgarashi Takuzo, Soto-shu, Tokyo 1980. The Japan Times Weekly, April 28th, 1984. Hozumi Genjo, Tokoji temple near Kyoto, August 12, 1984. For this item see: Linhart, Sepp, „Philosophie des japanischen Managements“, in: Linhart, S. (ed): Japanische Geistesströmungen, Literas, Wien, 1983. Linhart, Sepp : „Die Hintergründe des wirtschaftlichen Handelns der Japaner“, Journal für Betriebswirtschaft 2/1982, Linde, Wien. Idemitsu Sazo, The Eternal Japan, o.V ., Japan, 1978, private distribution. Gould, Rowland, The Matsushita Phenomenon, The Diamond Publishing, Tokyo, 1970. Similar concepts can be found among European medieval mystics, see: Suzuki Daisetz Teitaro, Der westliche und der östliche Weg, Ullstein, 1977, or in new philosophical tendencies in Europe and the USA, see: Bateson, Gregory, Geist und Natur, eine notwendige Einheit, Frankfurt am Main, Suhrkamp, 1984, or: Sheldrake, Rupert „Die Theorie der morphogenetischen Felder“, in: Kakuska, Rainer (ed. ), Andere Wirklichkeiten, Dianus Trikont, Muenchen, 1984. See:“ En, the Starting Point of Groupism“, in. The East, 20/2 (March 1984). 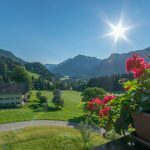 In this article not all the widespread implications of this concept can be mentioned, especially not the ones in connection with the idea of Karma and Rebirth. The author knows that these expositions are a simplification. Hirai Tomio, Zen Meditation Therapy, Japan Publications, Tokyo, 1975; Hirai is a psy­ chiatrist, who uses za-zen in the therapy of mental illness. The electro-encephalograms show a deep relaxation, deeper than in sleep or hypnosis. Similar results have been found in TM, see: Kary, Robert B., The Transzendential Meditation Program for Business People, AMACOM, New York, 1976. See: Kaspar, Helmut, “Sozialisation im Betrieb“, in: Management Enzyklopädie, Vol.8, Verlag Moderne Industrie, Landsberg am Lech, 1984. Wiener Zeitung, March Ist, 1985, „Einsame Cowboys in der Chefetage“. Pascale, Richard Tanner, „Zen and the Art of Management“, in: Harvard Business Review on Human Relations, Harper and Row, New York, 1979, p.125 ff. ; Pascale does not speak about zen, but uses this word to characterize „Japanism“. Corsten, Hans, „Die Partizipation als Determinante der Effizienz von Unternehmungen“, Wirtschaftswissenschaftliches Studium, Heft 2, Februar 1985, p.5 3 ff. See: Hendry, Joy, „Becoming Japanese: A Social Anthropological View of Child Rearing“, JASO, Vol. 15, No.2, trinity 1984, Oxford; and: Hendry, Joy, „Shoes: The Early Learning of an lmportant Distinction in Japanese Society“, in: Daniels, Gordon (ed. ), Europe interprets Japan, Paul Norbury Publications, Kent, p.125 ff. The Japan Times Weekly, April, 28th, 1984. Daizen, Victoria, „Japanese Corporate Zen“, in Bulletin of Concerned Asian Scholars, 12, 1, 1980, p.61 ff. ; Daizen Victoria quotes as an example Harada Sogaku (1870-1961) of the Hosshinji temple: „Forgetting the difference between self and others in every situation, you should always become completely one with your work. When ordered to march – tramp, tramp, when ordered to fire – bang, bang. This is the clear expression of the highest Bodhi-wisdom, the unity of Zen and war… „.